Many Mac users probably don’t think twice about the color that shows up when they select and highlight text or some app elements in OS X, which defaults to being blue. But if you’re the type of user who likes to customize things a bit, you may appreciate knowing that you can choose nearly any other selection highlight color, including the preset options of red, orang, yellow, green, blue, purple, pink, brown, graphite, or going all out and picking your own through a color picker. Aside from picking a color that better suits your preferences, changing the highlight color can also be helpful in conjunction with the Increase Contrast option in OS X as well as Dark Mode to make user interface elements a bit obvious in modern versions of the Mac operating system. 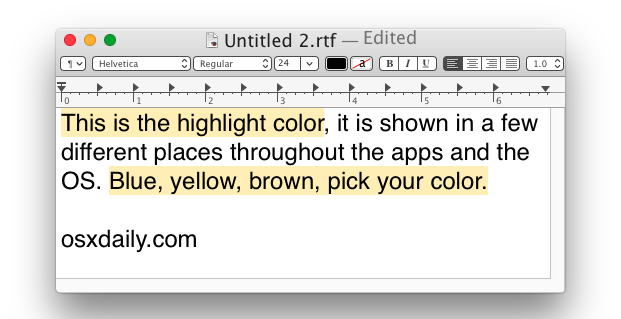 Just another small way to customize the appearance of your Mac, but no, at the moment there is no way to make a similar change to highlighting text in iOS, though in apps like iBooks you can apply different highlight colors for notes in iOS. Unfortunately, a lot of users don’t dig very deep when customizing their Macs, and that’s a shame. There are so many settings that they could access that would allow them to get more satisfaction from their Mac. Absolutely right, I think many people are afraid to poke around out of fear they’ll break something. That’s exactly what I hear from my customers. I just tell them that that’s what they have me for. If they break something, I fix it. For some users in OS X 10 and 10.1, the “Other” option returns only a pale green, whatever color one chooses (see link above). I called Apple and the person I spoke with tried it and confirmed it. She transferred my call to someone who filed the bug. I did this sooo long ago when I’m on another Mac or users account it looks weird. Annoyingly, the colour you select in the General pref pane is only used for text highlighting. For highlighting/selecting everywhere else, Apple uses a modified colour, which is stronger and an altered hue. If you create your own strong Yellow, for instance, the Finder will be a horrid shade of green. And of course the menus are still blue. How do you change the background screen color on a Mac in OS X 10.9.5 ? The bright standard color impacts my eyes and I have adjusted brightness etc and tried inverted but does not address the need effectively. i was playing around with different highlights and found i didn’t like them, however when i changed it back it stayed the same on my word documents. what do i do? Yes! Same here, did you ever fix it? More than this is, How can text colour change or invert it’s colour while highlighting? sometimes it works and sometimes not!